We can help your institution with capital campaigns, student recruiting, brand marketing, and graphic standards. We’ve accomplished a lot for three Oregon universities. Rogue Design Group has helped Southern Oregon University expand facilities, recruit students, and enrich endowments. Our fund raising projects were instrumental in the campaign to build SOU’s Center for the Visual Arts, raising capital from the private sector in fewer than 18 months. Our work also resulted in a multi-million dollar grant from the State Legislature to expand SOU’s Hannon Library. Willamette University’s Portland-based MBA program is geared toward working professionals who are looking to boost their careers. Rogue Design Group published Directions, a bi-annual report to alumni, donors, and students. The report focused on accomplished MBA graduates, faculty profiles, innovative programs, and current events. The objective was to raise awareness, recruit new students, and build upon fund-raising efforts. 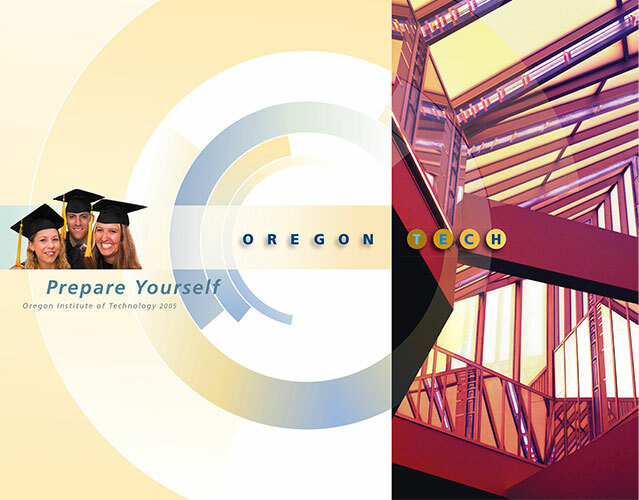 Rogue Design Group produced a variety of publications for Oregon Tech—from annual reports to student recruiting.